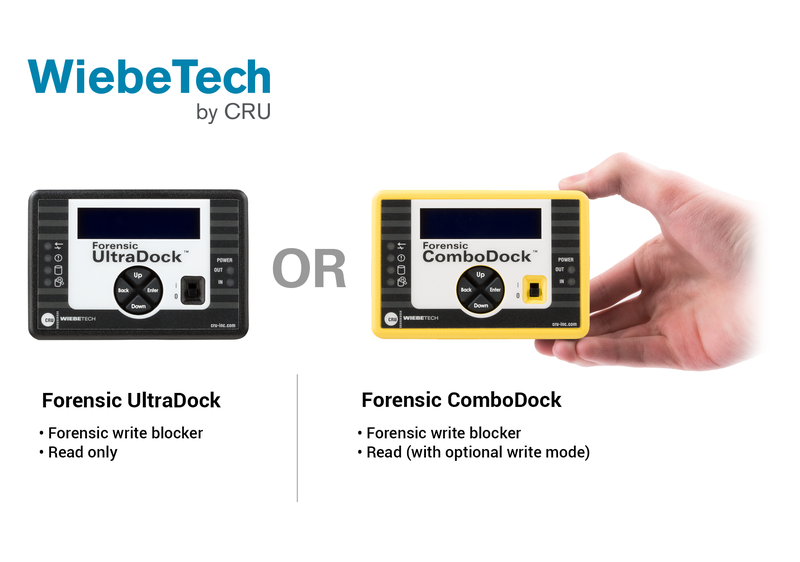 The Forensic ComboDock™ is a professional hard drive write blocker with read/write capabilities. Switching from write blocker mode to read/write mode is easy, but it's impossible to unintentionally turn off write blocking. ComboDock is a necessary part of your toolkit. Find a reseller near you or buy online. Q : Is this product compatible with Advanced Format drives? Advanced Format drives are manufactured with 4K sector sizes rather than the older 512 byte sector size. Nearly all drives manufactured today are Advanced Format. There are two types: 4K-Native (4Kn) drives and the far-more-common 512e (emulated 512 byte) drives. This product is compatible with 512e Advanced Format drives. Q : Has this forensic product been evaluated by NIST? NIST has evaluated older versions of several of our forensic products. Although the latest versions of these products have not been specifically tested, they employ the same basic write-blocking techniques used in the tested versions. NIST has stepped down their direct product testing and is instead providing a downloadable software tool for end users to test the write-blocking capabilities of any product. This tool does show that our current products successfully block a spectrum of data-altering commands. NIST’s tool is designed for linux. If your preferred OS is Windows, CRU provides a free software app called WriteBlocking Validation Utility available for download from our website. It’s modeled after NIST’s utility and was developed with NIST’s input. Our app has the ability to auto-generate reports ready for submission to NIST’s Federated Testing program, which is a community-based platform for sharing end user test results for forensic products. Q : Why is the drive serial number displayed in my forensic software different when I connect the dock via USB 3.0 versus eSATA or FireWire? There are two relevant types of USB commands for querying such information. One is an ATA pass-through Identify Device command intended for gathering drive information. The other is a SCSI Inquiry command intended for gathering controller information, but which is often used for gathering information from drives connected via a USB bridge. The USB 3.0 chip inside the dock supports both commands, but returns different information in accordance with the original intent of the specification. When it receives an ATA pass-through command, it returns the S/N of the attached drive. When it receives a SCSI Inquiry command, it returns its own controller S/N. The governing specification assumes that the software/OS will send both types of commands: first the SCSI Inquiry command to gather controller information, then the ATA pass-through command to gather drive information. However, some software only sends the SCSI Inquiry command. Such software will incorrectly display the controller S/N in place of the drive S/N. 1. Use a different connection type to read the correct S/N and document it in your reports. 2. Get the drive S/N from the LCD menu of the dock and document it in your reports. 3. Use CRU's Forensic Software Utility or WriteBlocker Validation Utility to see the correct drive serial number. These free software utilities allow you to save the displayed information to a text file for inclusion in reports. 4. Contact the software developer and ask them to implement support for the ATA pass-through Identify Device command. Q : I tried to create/remove an HPA/DCO on my drive and it did not appear to work. What could be causing this issue? While there are specifications that hard drive manufacturer's are required to follow, sometimes they are implemented differently. In most cases adding or removing an HPA/DCO requires a powercycle of the drives power between each step. The powercycle is not defined and some require a full shut down of the drive, while others only require a command to be issued to the drive. If you tried to create/remove an HPA/DCO and it did not work our suggestion is to physically power the dock product down after each step in the process. Power multiple Drive eRazer Ultras or v5 docks using one cord.